Kello / Clock expresses time by using lights and shapes. Its tessellation is composed of sixty triangles and twelve rhombs, which represent hours, minutes and seconds. Through symmetrical and asymmetrical patterns, it displays a cyclic division of time that forms the core of all clocks. We defined a system that determines when and how the tilings change. This piece, like any clock, divides time into equal parts. The symmetries change according to the periods of seconds, minutes and hours. In our clock, each hour has a different way of changing its symmetries, sometimes clockwise, sometimes mirroring, sometimes from the center towards the edges and so on. We considered different illuminating patterns that could be used to tell the time. We first thought about using the amount of translational and reflective symmetries to tell the time. 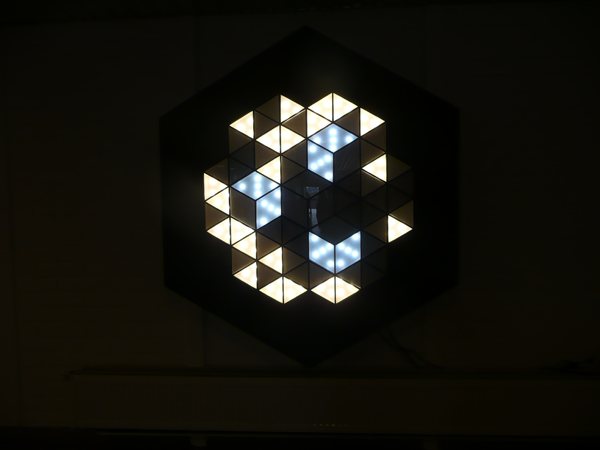 Eventually, we chose to use a system where the amount of illuminated shapes tells the time. This means that a pattern of four illuminated diamonds represents four o’clock. Similarly a pattern of fifty illuminated triangles represents fifty minutes. The composition of the minutes changes every second, and the composition of hours every minute. Kello / Clock is about 30cm thick, and has a diagonal of nearly 170cm. Developed by Marloes van Son, Siyan Zhuang, Satu Kruus and Liisi Huotari for the course 'Crystal Flowers in Halls of Mirrors: Mathematics meets Art and Architecture 2015' at Aalto University.